– to be competetive | brainsnorts inc. 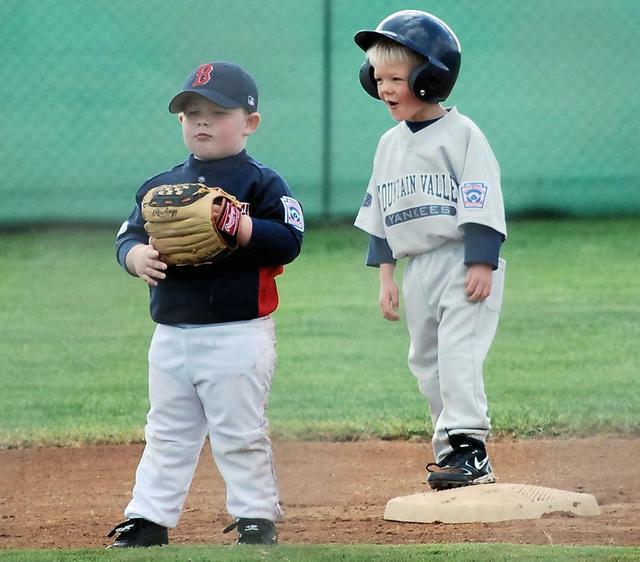 It once meant something when you “made the team.” You went to try-outs, struggled through practice, had a number pinned on your shirt as you caught passes or fly balls. You stood in front of judges and “nailed it” as best you could, but that “best” doesn’t seem to mean anything anymore. I know that self-esteem is important for a child, but so is accomplishment. By allowing everyone to make the team, it no longer means anything to make the team. In a town I won’t name there’s a high school cheerleading squad with thirty girls, thirty teenage girls with cell phones and a desire to talk trash about anyone else as soon as one of them walks away. It’s a MySpace disaster waiting to happen. Thirty girls is fifteen too many, but the coach isn’t allowed to hold tryouts or cut anyone because everyone is too worried about the self-esteem of the girls who don’t make the squad. However, because they are all guaranteed a spot, they hold no value for it. If the coach isn’t allowed to cut anyone, even for poor behavior, they’re going to behave like brats, like when some of the girls refused to cheer because they didn’t like what the coach was telling them to do. When the coach finally did attempt to kick a girl off the team, girl’s mother sent threatening e-mails to the coach, athletic director, and principal. With each e-mail, the coach offered to meet with and talk to the parents in person, but each time they refused and sent more threatening e-mails until finally the school administration put the girl back on the team and reprimanded the coach, all because the cheerleader had suffered “irreparable harm to her self esteem.” If a coach slaps my kid, yeah, I want an apology and a reprimand. But if my kid is breaking team rules, then I want my kid reprimanded instead. Schools are giving too much power to parents because it also gives too much power to the kids. If it’s not cheerleaders, it’s football, basketball, or anything else that involves a team. Did I say “team”? Oh, I forgot, we don’t have “teams” anymore. We have collections of individuals all out to improve their stats and their chances of a scholarship. This is why parents hold their kids back from what should be their first year of kindergarten, so they’ll be a year older, bigger, faster, stronger, and (maybe) smarter than the rest of the class. Then they’ll stand out more on the field, on the court, in the classroom, and (maybe) on the SAT and college applications. We all want our kids to succeed, but at what cost? Is it worth it for your kid to be at the top of the class when they’re really in the wrong class? If that’s what it takes to get a top college scholarship, well maybe so, even though you’re kind of cheating against younger kids. It’s kind of like putting an 8th grader in gym class against 7th graders. It may seem like only one year, but it’s also 12% of their educational life. And what do you say to your kid when he or she is about to be a high school senior, and they figure out that they really should have graduated the previous year? Maybe they’ll think it’s worth it because of the rewards, but maybe they’ll be a little upset if they think that you’ve cheated them out of a year of their life. December 30, 2010 in kids, parenting.